The Palestine Strategic Report (PSR) is one of al-Zaytouna’s most important academic studies, published periodically in both English and Arabic. Today, it can be surely asserted that PSR is a must reference for every researcher and academic who are interested in the contemporary developments of the Palestine issue and the Arab-Israeli conflict. The PSR reviews biennially the various developments concerning the Palestine question in a comprehensive, objective and academic manner. It offers a wealth of data, up-to-date statistics, and analyzes and offers an outlook of future events. The Palestine Strategic Report (PSR) is one of al-Zaytouna’s most important academic studies, published periodically in both English and Arabic. Today, it can be surely asserted that PSR is a must reference for every researcher and academic who are interested in the contemporary developments of the Palestinian issue and the Arab-Israeli conflict. The PSR 2014-2015, the ninth in its series, falls in 521 pages and seven chapters. Edited by Dr. Mohsen Mohammad Saleh, PSR 2016-2017 was written by 12 specialized researchers, and reviewed by four consultants. 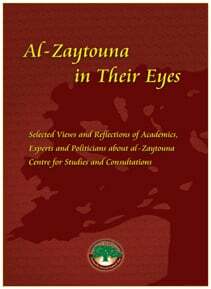 Al-Zaytouna Centre for Studies and Consultations is glad, after seven years of its establishment, to occupy an advanced position among studies centres and think tanks specialized in political and strategic studies related to the Palestinian issue. It pleases the Centre to place in the hands of the reader a number of testimonials that it had received on the seventh anniversary of its establishment and on other occasions, from a group of politicians, experts and academics. These testimonials reflect the excellent reputation that the Centre enjoys in their circles. The following are excerpts from their letters sent to the Centre, which we are putting on the website so the reader would get an idea of the impressions and letters we had received. Prof. Dr. John Dugard, Professor of international law. Former Special Rapporteur on the situation of human rights in the Palestinian territories occupied by Israel since 1967. The materials I regularly receive from al-Zaytouna Centre are extremely informative and are useful to me for my writing and speaking. The analyses, contained therein, are thoughtful, penetrating and in-depth. I am additionally favorably impressed with the books, published by the Centre. They are valuable studies. Finally, I am intrigued by the conferences that the Centre plans and holds… Please continue your good work. Prof. Dr. Norton Mezvinsky, Distinguished Professor of History (emeritus), Connecticut State University, USA. President, International Council for Middle East Studies, Washington, D.C.